First of all this thread is for Newbies that is new to SEO and have no idea what they are doing. There are some good threads for newbies like lightningblitz's thread (sorry i couldn't find thread url but maybe someone can share it below).So i suggest everyone who is new to SEO to take a look at these threads before starting SEO. Don't even buy a domain name before you read and understand these beginners guides on BHW. The reason is you will fail,loose your will and that will make you quit SEO before you even start. Now this is my method to rank for Low-Medium Low Competition Keywords in 30-45 days on Google. I tried to explain all steps in details but if you have any question post your question on the thread and i will try to reply asap. There are 2 types of keywords in my opinion. The keywords that sells and the keywords that can bring you cash from ads like Adsense etc. You will build your niche site around these keywords to get traffic from Google and redirect the visitors with your aff. links to those sites and get commision when that item sells. The keywords that can bring you cash from ads are like service,local search,informative keywords. You can't sell them as a product but you can put ads of other services on your site and promote them. And the easiest way of this is using Google Adsense on your site. For example "car wash near downtown houston". For me a profitable keyword is this. If i can get my investment back after 5-6 months of ranking a domain that is a great investment. For example i spent $200 to rank a keyword(s). It took me 2 months to rank that keyword. After i rank that keyword i started making $40/Month. In 10 months i will make $400. I spent $200 and i made $400 in 12 months. I doubled my investment which is great. So lets assume you have a product like this: "C47 Digital Camera" and it has about 1500 searches/month. You spent 300 dollars to rank for that keyword. You hit first page of google for that term. Lets say you get 150 visitors from Google/month. 50 people clicked your aff link and went to Amazon. And from that 50 people 5 people bought the camera. Lets say the camera is $300. Amazon will pay you about 4% which make your commision $12. 12x5=60 Dollars/month .60x10 Months = 600 Dollars/Year. That is a really profitable keyword that doubled our investment. Believe it or not there are 100K's of keywords which you can rank and make profit from. I think this is the main mistake that newbies do. We have all been there and lost money because we tried to rank keywords that was impossible to rank. That is like learning chess yesterday and trying to take down Kasparov today. You have no experience,probably limited budgets and trying to rank for "payday loans". That won't happen. The reason is even you have enough knowledge you don't have the budget of those big players. So you have to apply the formula above. If you can double your investment in 1 year it is a great deal take it. So how will we choose the keywords that we can rank? Choose a seed keyword. For example "LCD Tv". Put that in google keyword tool and try to find long tail keywords that have searches more than 1000. The more the better but don't forget it will get harder to rank as search number goes higher. After that export the list to excel or txt file. If you don't have a budget for a keyword search tool u need some manual work here. Or you can use scrapebox to get the low hanging fruits. What you can do here is search google for ----- intitle:"long tail keyword 1" and the less the results the better. So for example you find a keyword under 1000 results that is a good keyword. But that is not enough to say we can rank it yet. Get all the keywords with low results and go to www.keywordrevealer.com . It is a free comp. checker tool for upto 10 keywords/day. Put the keywords you find on the tool and click evaluate. If you can find a keyword that has lower than 25 Competition score you will most probably can rank that keyword with the method below. If it is lower than 20 or 10 it is even better. If you don't have time for this and you have the budget just get "long tail pro" to find long tail keywords. I guess it is like $40/month or something.It automates the whole process. When you find good keywords put them again to keywordrevealer.com and try to get keywords under 25 comp. score. So you decided your target keyword. We will choose 2-3 more longtail target keywords now. Write your keyword on google search and it will give you some related keywords. Copy and paste them on google keyword tool and get their monthly searches. For example your target keyword is "Nikon Coolpix L340 Digital Camera" and have 1000 monthly searches. Your longtail target keyword 1 can be "Nikon Coolpix L340 Digital Camera Review" and have 400 searches/month. Your longtail target keyword 2 can be "nikon coolpix l340 digital camera price" and have 300 searches/month. If the total searches of target keyword+long tail target keywords are between 2K-3K it is good enough for me. First of all because we are building a micro niche website so we can use an exact match domain or partial match domain. In short "targetkeyword.com" will be our domain. There is an important factor here that can effect the whole project. When you are buying the domain you have to be careful that the domain didn't get used before. We want a clean domain with no backlinks or history. So what i do is add something like 2016 or reviews at the end of the domain. Like "targetkeyword2016.com" and check the backlink profile before i buy the domain. Also check it from archive.com to see if the domain is used or not before. I am not an expert on Onpage SEO so i suggest you to read the threads on BHW. There are some great tutorials for Onpage SEO. Setup WP. Install all in one seo pack,google xml sitemaps plugin, wp no external links plugin.I use a nice simple clean theme don't like themes with lots of widgets,boxes etc. I usually use 2500 Words of Unique Handwritten Content on my Money Site. But i believe the more the better. I had some great results with 10K content. But for start 2.5K would be enough. 1 Long (1000-1200 Words) Handwritten Unique Article about Target Keyword. We will make this our main page. So it should be engaging content. Do not get cheap on this one. This is the part Google will decide if the page is good or not. You wouldn't want visitors going in and storming out.Also it will increase your conversions a lot and make you sales.I keep the keyword density between 2-3% not because google loves it but because if you use a lot of keywords in your article it doesn't look natural to visitors. 3 Smaller (500 Words) Handwritten Unique Articles about Long Tail Target Keywords. So the articles will be about "target keyword review" or "target keyword discount".Keep the keyword density between 2-3%. You can add tos and disclamer pages and a contact page too if you want. Some say it adds authority=). Your choice. I always add 2-3 relevant images to the posts and set description for those images with my longtail target keywords. I try to add a nice youtube video that is about the product or service without ads. It is good because if visitors watch it they will spend more time on your site and google loves that. If you will use affliate links on your page be sure to shorten them via bit.ly or other url shortener first. The no external link plugin will add nofollow to all outgoing links. So this is pretty much it for what i do for Onpage SEO and how i build the site. This is the most important part. Ranked more than 70 sites with this method last year and it passed all the updates and if you choose the keywords as i explained above there is no reason that you can't rank them too. This contains 3 different sources of backlinks. 1- Web 2.0's. We have to use only high authority domains like Wordpress,Blogger (Make Sure They are All ********) etc. We need 1 unique handwritten article of 500 Words for each property. 2- PBN's. We need only 5 posts from 5 different Blogs with DA>20 and above and TF>10 with more than 300 backlinks. The more backlinks the better but the backlink profile must be clean. 3- Social Share. I do this not because of SEO but i want the site to look more natural to Google. Maybe some traffic can flow from those links too. Mention all your posts on FB,twitter and google +1 and that is it. I don't buy any shares or likes. You don't have to spend any money on this one. You can also add some MAX 5 social shares on Digg,Reddit etc. But don't over do it. Max 5 is enough. We will build backlinks to not only homepage but subpages (long tail target keyword pages) too. Please look at the diagram below. We will build total of 3 target anchor keywords from Web 2.0's and Pbn's to Home Page. 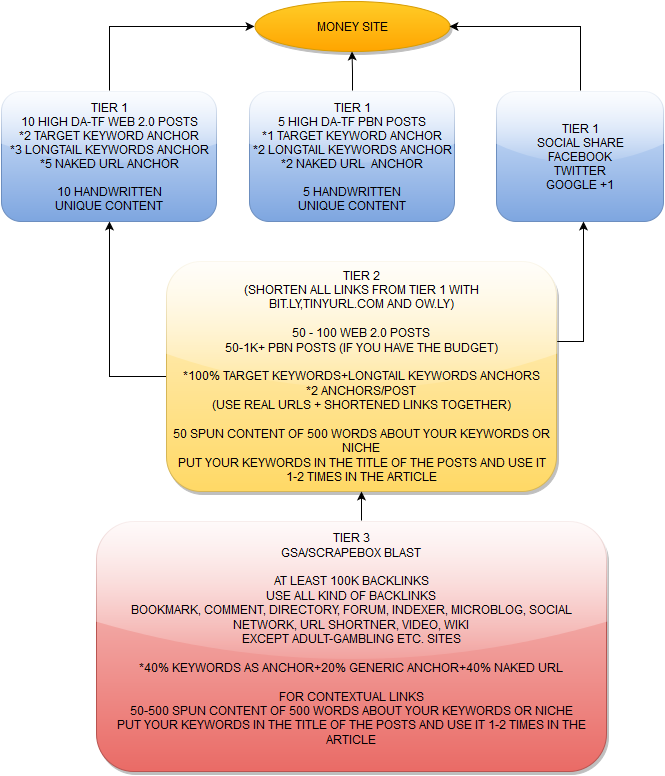 We will build total of 5 longtail target anchor keywords from Web 2.0's and Pbn's to Sub Pages. We will build total of 7 naked url anchors from Web 2.0's and Pbn's to Main Page And Sub Pages. We will build total of 12 Mentions from FB,Twitter And Google +1 to Main Page And Sub Pages. 2- Mix them with actual urls and make a list of urls.We will use this list for Tier 2 submissions. 3- Make 50-100 Web 2.0's posts (only high authority domains like Wordpress,Blogger (Make Sure They are All ********) etc) and build 2 backlinks/post to this url list. You should use about 50 unique spun articles about your niche or keywords for this one. 4- If you have budget build 50-1K pbn post backlinks to this URL list. Use 2 backlinks/post. 1- Shorten The 50-100 Web 2.0 Posts List With Bit.ly or Other Url Shorteners. 4- Use bookmark,directory,forum,comment,indexer,microblog ,social network,url shortener,video,wiki backlinks. If you have done all of the above correctly your new site should rank on first page of google for your target keyword in 30-45 Days. And if you are lucky your long tail target keywords should rank first page too. If your site gets stuck at top of page 2 build 5 more PBN Posts with generic anchors and naked urls to your Main Page and subpages. Do not use target keywords as anchors. Do not think SEO as a short term business. It won't make you rich overnight but if you see this as a long term project in 1 year you can have a really nice income with minimum investment. Post here if you have any questions and i will try to answer them asap.